Solitary confinement is wrong, whether it’s in here or in Iran. Seven months after my release from captivity in Iran, I am standing in a prison cell again. Like the cells I’ve gone back to in my dreams, this one was built for solitary confinement, and as I look around, I feel myself struggling to breathe, as if I can’t get enough air. It’s something that happens to me from time to time, especially in tight spaces. And this cell, at a little more than 11 by 7 feet, is smaller than any I ever inhabited. I’m in the Security Housing Unit, or SHU, at Pelican Bay State Prison in Northern California. Here, 94 percent of SHU inmates are celled alone for 23 hours a day. They spend one hour a day, also alone, in a concrete, 16-by-25-foot “dog run.” They are not allowed phone calls or contact visits. Clocks, playing cards and chessboards are banned. My guide asks me how it compares to Iran, where I was held for 26 months. I want to tell him that no part of my experience – not the uncertainty of when I would be free again, not the tortured screams of other prisoners – was worse than the four months I spent in solitary. But that’s not what comes out. All I can say is, “I had a window.” For hours, days, I fixated on the patch of sunlight cast against my wall through that barred and grated opening. When, after five weeks, my knees buckled and I fell to the ground, utterly broken, it was this patch of sunlight that brought me back. Its slow movement against the wall reminded me that the world did in fact turn and that time was something other than the stagnant pool my life was draining into. At Pelican Bay’s SHU, there are no windows. It is well established that solitary confinement is cruel and psychologically damaging. In the last few weeks, Amnesty International, Human Rights Watch and the ACLU have released reports detailing the serious mental and physical health problems that solitary confinement causes after just a few months or years. It is well established that solitary confinement is cruel and psychologically damaging. Yet in California, at least 3,808 people are serving indeterminate sentences of isolation. At Pelican Bay, the average SHU inmate serves seven and a half years in isolation. Eighty-nine SHU prisoners have been there for at least 20 years. One has been in solitary for an unimaginable 42 years. They aren’t in solitary indefinitely for the reasons you might think. Inmates actually get relatively short SHU sentences for, say, killing another inmate. Many of the SHU’s indefinite residents haven’t even broken prison rules. They are there because the California Department of Corrections claims they are connected to prison gangs. But as I found in reviewing hundreds of pages of prison files and court records, the “evidence” of gang connections is, in many cases, shockingly thin. Three-quarters of inmates serving indeterminate SHU sentences are classified only as prison gang “associates,” not gang members. That’s a designation that can come simply from talking to someone affiliated with a gang. Many of the SHU’s indefinite residents haven’t even broken prison rules. They are there because the California Department of Corrections claims they are connected to prison gangs. The California Department of Corrections and Rehabilitation’s confidential “gang validation” manual, which I obtained from a source, teaches investigators that even the use of the words tio or hermano, ordinary Spanish words for “uncle” and “brother,” can indicate gang activity. So-called validation points have included possession of Machiavelli’s “The Prince” or Sun Tzu’s “The Art of War.” One inmate’s gang validation includes a Christmas card with stars drawn on it – alleged gang symbols – amid Hershey’s kisses and candy canes. Keeping people in isolated boxes isn’t cheap. It costs Pelican Bay at least 20 percent more to keep an inmate in isolation, which adds some $14 million a year to the state’s budget. And that is for only one of California’s five SHUs. At no point in the gang-validation process is there any judicial oversight. Decisions that put a man in the hole for decades are made in closed-door hearings in which a single prison staffer acts as judge and jury. Inmates are not allowed to call witnesses, gather evidence in their defense or even have a lawyer present. Evidence provided by informants is kept confidential and is thus impossible to refute. Once they are sentenced to the SHU, inmates have the right to appeal, but this is a mere formality. Corrections staff couldn’t provide me with a single example of a gang validation that was overturned without intervention by the courts. Many prisoners have turned to the courts for redress, but they are met with little sympathy. As one judge ruled, “A prisoner has no constitutionally guaranteed immunity from being falsely or wrongfully accused of conduct which may result in the deprivation of a protected liberty interest.” In other words, it is legal for prison authorities to lock somebody up in solitary. I am intimately familiar with such logic – it is the foundation of the Iranian judicial system. Such arbitrariness and cruelty has no place in a constitutional democracy. California should reexamine this practice. Shane Bauer has been reporting on solitary confinement for Mother Jones and the Investigative Fund at the Nation Institute. His feature article on the subject can be read in Mother Jones. This op-ed first appeared Oct. 18 in the Los Angeles Times and is reprinted with permission. Prisoner supporters see the article written by Shane Bauer in Mother Jones magazine as a major step forward in the campaign against solitary confinement. Now Shane wants prisoners themselves to read it. Mother Jones has very generously agreed to mail a copy of the magazine containing Shane’s story – of which this LA Times op-ed is just a tiny taste – to each prisoner who requests it. Write to: Mother Jones Magazine, Attn: Customer Service, 222 Sutter St., Suite 600, San Francisco, CA 94108. I really don't get all the hype about the Shane Bauer article. The Bay View, Hunger Strike Solidarity Coalition, Solitary Watch, and even many mainstream media outlets have already long reported every single thing (and more) that Bauer reported. There's nothing new that he wrote. 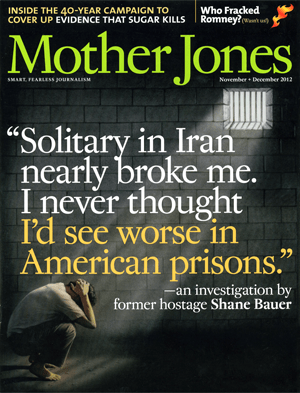 Like Shane Bauer, I was imprisoned in Iran as a foreigner accused of espionage – http://andreasmoser.wordpress.com/2009/07/30/repo… – and I have been to prisons in the US when working there as a lawyer. NO, the (prison) systems in both countries are not the same. Just ask yourself if an article like this could appear in Iran. The American penal system is rotten in many places, but comparing it to a system that tortures and kills political opponents in its prisons is not helpful for the required debate. Go to prison in South Korea, where they don't have a social welfare system. In South Korea, the state doesn't provide inmates with food and water. Their families provide it. If you make the mistake of killing all of your family or if you family decides it wants nothing to do with you, well, you're out of luck. However both the wholesalers and retailers said wholesale prices varied from dealing in retail in many parts of the city. We are all hoping that this will be solved and that they all be at peace. Nobody ever thought that this could happen to both countries for both county benefits to each other. Prisoners are still people who have committed crimes they are not treated as animals. I guess this is no the worse if you go to Asian countries Philippines, prisoners there will die because of the lack of food and lack of supply of medical attention. Prisoners should be treated as citizen not as animal because punishment is judicial order and it should not be crossed. I think prisoners are people who commit evil things but they are people who also have regrets on what they are doing. However with regards to prison like this they should treat people like animals but they have to implement human rights and let them serve their sentence. I enjoy what you guys are usually up too. This type of clever work and coverage! Keep up the good works guys I've added you guys to our blogroll. Oh my goodness! Impressive article dude! Thank you so much, However I am having troubles with your RSS. I don’t understand the reason why I cannot join it. Is there anybody having similar RSS issues? Anyone that knows the answer can you kindly respond? Thanks!! Numerous other people wipl bbe benefited out of your writing. Regular visits here are the best way to thank you for your effort, which is the reason why I’m visiting the site everyday, looking for new, interesting info. Many, many thanks! he company with it’s ShrinkFit trademark stands leader in India and overseas market. Amazing weblog. I experienced studying your content. This is truly an excellent study for me. I have saved it and I am eager for studying new content. Keep up the good work!